Most of you will not know the name David Kato so let me give you a very brief intro. David Kato was a Ugandan who was gay. 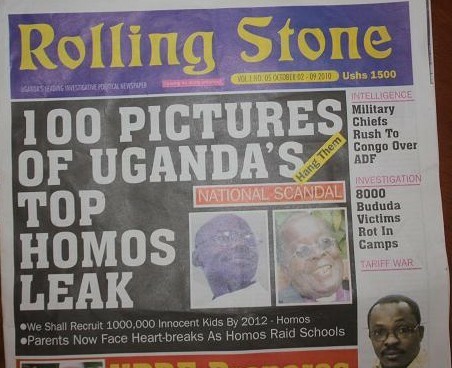 He was ridiculed and hated for it but he became an outspoken advocate for gay rights in Uganda. Last week someone entered David Kato’s house and bludgeoned him to death with a hammer. “In recent years, conservative American evangelical churches have had a profound influence on society in Uganda and other African nations. They send missions and help fund local churches that share their brand of Christianity. Sermons and seminars by American evangelist preachers are staples on local television and radio networks across the continent. A month after the visit of American evangelists a new bill it introduced. A bill that significantly increases the punishment for those “caught” being gay. Lengthy imprisonments and the possibility of death were part of this new bill. Citizens were also encouraged to turn in the names of those suspected of being gay. A newspaper at the time, published the names and photographs of 100 gay individuals and activists along with the encouragement to kill them. David Kato was on the list. A year later David Kato is dead. But greater questions and concerns, at least on my part, remain as well. I was not aware that the Gospel Jesus told us to preach about HIM, included a mandate to attack the “queers?” Since when are we to go into all the world and tell people that one group of individuals are the worse sinners of all time? Do we have the right? Why do we as believers continually distort the Gospel message with our own preferences? Can we not see that WE are responsible for driving people from the love, grace, and forgiveness of God? That Jesus came in to the world not to condemn the world but to save it…. That Christ died for our sins, and that He was buried that He rose again according to the Scripture…..
And that God so loved the world He sent His Son, and that in believing we have eternal life here and beyond. Anything else is a false gospel. Anything that takes the focus off of Jesus is from the pit of hell. Thank you for sharing this post. It is very important that intelligent discourse and rational thought enter this world-wide debate. I saw a current.tv documentary program that highlighted the visits and situations you refer to here exactly and it is still haunting. Anyone who would use a gospel of love as a tool for hatred or even exclusion toward others that differ is ignorant of the true message. If anyone wants to know about the WWJD factor, take a look at his guest list for his dinner parties. Who are we to decide who eats at His table? Christians can be an odd bunch. So willing to find splinters in the eyes of others…denying the plank in theirs. You are so right that Jesus lived among and love the fringe element of society. He was not afraid to cross all kinds of social/cultural norms and barriers to extend love, forgiveness, and mercy. The true message has been lost among many of the leaders in today’s christianity. I am afraid what we call Christianity is nothing more than a empty shell. Thank you for your insightful comments. When we have eyes to see, we pray that they will have ears to hear. We have become a body of people so afraid of sin and hell that we forget to let Jesus live through us. I wish I could say that I was surpised to hear that pastors fear to preach the truth because they didn’t want to lose their jobs at the hands of closed minded bigots who tithe and look so nice in their Sunday best. I wish it were shocking to see evangelical leaders pandering to politics and bowing down to the idol of human power and government. I wish, I really wish we Christians were known as a people of immense love, conomprehensible and inexhaustible compassion and absolute generosity. Joseph, what you have said resonates deeply with me. It is my passion to see the Gospel returned to the Glory that it deserves. A Gospel overflowing with love, compassion, mercy and grace. Thank you for being one of the few that make me feel that I am not alone in this battle. This kind of seething hatred reminds me of something my brother told me after a recent trip to Jamaica where the number one song on the island was a song called “gas em up, light em up.” It was a song encouraging people to light homosexuals on fire. The fire these “evangelists” started was no less damaging, weather they want to admit to it or not. Come on, now. As the lovely mural over on the East side says – “Jesus says QUIT PLAYIN.” Jesus never told us it was up to us to judge each other. That part was made up by mankind. Jesus wants us to love and help each other. Be excellent to each other! The American Church has been functioning from a place of fear instead of love. And I am not sure we fear homosexuality as much as we fear God’s judgment, which is sad because that indicates we have no understanding of grace. It also shows a huge misunderstanding of love because perfect love casts out all fear. In fact, I would say we fear because we have not experienced God. We have experienced religion. And now, sadly, we spread the fear to other nations. There are a couple of problems that I had with the post: First, I did not see any correlation in your post between the visit of evangelists and the employment of a particular bill that was hostile to homosexual individuals outside of a circumstantial correlation. While this does not mean that the latter was [not] an effect of the former, the contrary seems to be an improper conclusion as well. Second, you have the basics of the Gospel down accurately, but the issue of preaching against homosexuality is the equivalent of preaching against any kind of immorality. We are not a church, as you undoubtedly know, that is built on and defended by the weapons that the world uses, but those that are to break through the strongholds of the mind to exhort one to obedience to Christ (2Co 10:4-5). We have a responsibility to encourage the world away from sin, to witness of the regeneration brought on through the Holy Spirit and obedience to Christ, but this with gentleness and respect. Thank you for your comments. If you would look into the story, you would see, Uganda already had hatred toward LGBT individuals and the “evangelists” only stoked the fires so to speak, resulting in that bill. I also do not think it is the job of Christians to go around the world pointing out, what they feel, are the sins of other peoples. I, for one, have enough weaknesses and sins and failures in my own life that disqualify me from taking up the position of judge over others. I will leave that to the Holy Spirit to convict, and God to judge. My “job” is to tell others about the amazing love, forgiveness, grace and mercy God extends to all people bound by the chains of whatever is hindering them (sin, if you will), from becoming what God has calling them to be. We are called to love individuals and show them that there is a better way, a way that the world cannot fathom, a way of Love. These “evangelists” were not preaching The Gospel, they were stirring up hate. Hate that they knew existed BEFORE they got there. And now once again the world sees the church as a place of hate and judgement rather than a place for healing, forgiveness and hope in a hopeless world. Is there enough evidence to show that the bill was a direct consequence of the evangelists? While it is possible, everything seems to be circumstantial at best. A direct consequence would be political influence to enact a change, which descends all of the way to influencing the majority or the strongest minority. It is evidence of this influence that can support the conclusion that they were directly involved. Now, because I do not know enough about it, I cannot say they were or were not, but this is more of a question against the conclusion. As for the Gospel, it is not simply a feel good message; this is what is corrupting congregations all over the world. It certainly is good news, but it is a stark warning of condemnation against those who live against God, according to their own desires. Jesus ministry was a ministry that exhorted the people to repent (Mt 3:2; 4:17) and believe in the One God sent (Jn 3:16). We need to remember that part of our ministering to others includes this point. We must exhort the world to repentance and faith on the Lord Jesus and part of this is preaching against immorality, much like Paul preached to the church, among which, the Romans and Corinthians (contained within each of the letters), and what Peter preached while in Jerusalem (Acts 2:38-39). There are many more instances in which this was a common message, but for the sake of space, I will limit it to these instances. This is an unavoidable part of the Gospel, which I love, just as much is the command to witness with gentleness and respect relevant to our evangelism. What I do not understand is that there is this “fear” among so many Christians that if we focus too much on God’s love or His grace that somehow people will either not come to Christ because they don’t see their sin, or come to Christ but not see their need for change, or if they are a Christian, jump headlong into hedonistic pleasures. But the reverse is true, His love compells people to want to live for Him. I do not tell others a “feel good message” I tell them that in this world you will struggle, and fall, and hurt and never really find a love that is unconditional. I tell them that is is Someone who knows them more intimately than they know themselves and in spite of that, offers to them a relationship through the One who knows everything we struggle with. I tell them that God has such a love for the world that He sent Jesus to die to take away our sin and offer to us an unconditional love that never changes and that when we come to Him he will never be angry with them again. I tell them one on one, when we are friends, when I have earned the right. I do not stand with placards condemning the non believer, I do not call them names and dergrade them , and look down my nose at them as wicked pagans. Most of the letters Paul and Peter and the others wrote were addressed to people in the church not to those outside. And again I am too weak, and I fall into sin too many times to feel I have the right to place myself in the judgement seat over others. But I know that even at my worst God still loves me and picks me back up and extends grace to me every moment of every day, because of Jesus. We are all God’s children which makes us all family. We are all in the same boat. We have no right to cast dispersions on each other in any way. To quote from the book of Tupac, “Only God can judge me.” David Cross once said of the Bible, “It is the worlds oldest, longest game of telephone.” (God’s words interpreted by man.) Jesus came to save us from propaganda. God is LOVE. I don’t believe for an instant that diverging a society away from sin, no matter how you define sin, will result in the regeneration of anyone or any thing. In fact it may do the opposite. Biblica repentence is a result of something that first began with God. With the touch of God, John would have been standing alone in the Jordan or the only people who would come were the ones who merely feared hell. True repentence comes not by cleaning up our lives or stopping society from allowing sin but from the touch of God on our hearts. It’s not something we can muster, build up to, work our way towards. It’s a response. Legislating morality on the world only drives the sin deeper and makes it more clandestine–proibition well prooved the point. The verse in 2 Corinthians you quote is directed at people who are already regenerated, the church–not the government at Corinth. Before we as a church try to legislate righteousness or morality, we’de better take a look at our own integrity. Whether or not you can demonstrate direct evidence that hate speech in the name of god incited this particular piece of legislation isn’t the point but the fact that it fed it and cultivated cannot be denied. Gosh that’s digging for loopholes so that the fear mongers can squirm out before they can sully their Sunday suits. Jesus clearly, very clearly, didn’t concern himself with the government. He did involve himself in people’s live and even to a very limited extent the temple but not the government. And making laws that conform to Christian morality doesn’t, absolutely does not, benefit the souls who live under its jurisdiction when we stand before the throne. It doesn’t convince anyone to follow God. I do believe that you misunderstood what I wrote. I was not saying that it was man’s work to become sinless and regenerated, but specifically pointed to the Holy Spirit as the source of this. Nevertheless, the message of the cross is a message of faith and repentance and Jesus preached this during His ministry (I referred to this in a post above). Even before Jesus ascended, He commanded us to go into the world witnessing and teaching them to obey His commands, which includes the exhortation away from immorality. The Gospel without encouraging repentance, like Jesus preached from the beginning of His ministry, is nonsense; the Gospel without pointing out the hopeless sinfulness in man is an ineffectual gospel. What is the value of hearing the need to believe without knowing why it is needed? Witnessing is more than just promising a general hope where there was no hope and contentment where there was no contentment, the Gospel is [always] contrasted with the utter sinfulness of man. Therefore, I write again, that preaching against homosexuality is equivalent to preaching against immorality, exhorting to repentance. As for the verse, it is not bound to within the church, for it is quite relevant to the church’s relation to the opposing minds of the world. It is instruction in how we are to live and relate to those who establish themselves against God. As many times as we see in scripture where a verse has multiple meanings (immediate relevance and a future relevance), it should be no hard thing to swallow that this is [not] just referring to interactions within the church. The fact that something fed hate and persecution does not make that thing bad by virtue of its influence. I recall a young man who was influenced by a German philosopher by the name of Nietzsche. He read Nietzsche’s writings on the Übermensch and this influenced and supported his future persecution and genocide of six million Jews, among many other ethnic groups and “lesser” humans. The philosophy of the Übermensch is not necessarily bad because of the fact that someone ran wildly with it, but must be judged according to its own relation with reality. Any person can take an otherwise peaceful and harmless message and mold it into something to fuel existing hatred; this does not, however, make the message bad. The reality is that the conclusion must be a logical effect of a particular cause and, without evidence beyond the circumstantial, one cannot conclude appropriately one way or the other. What is occurring here is a vilification of individuals that could very well be innocent. I believe that there is a passage somewhere that says that the unregenerate cannot understand the spiritual things of God. I would take that to mean that in all our pontificating as believers in the faces of non-believers about morality, and sin, and judgement, and holiness, that doesn’t really conviction since it sounds, to them like we are speaking a foreign language. I also take it mean that it takes a move of God in the person’s life to open their eyes. So again , I have to say that if I am in a position in a persons life as a loving friend and God moves in that persons life I will have the opportunity to share about the need for repentance, and God’s forgiveness and daily grace. And God will bring change. All the “God hates fags” placards and Home Depot boycotts combined will not do anything, it is a move of the Spirit alone. I understand what you are saying, and I am not discounting your thoughts, in fact for the first part of my Christian experience I was there too. God has called me to a different ministry now. If we are called to “love our neighbors as ourselves” how can that feed hatred and persecution of others? It will feed hatred and persecution of Christians if we truly live out Christ’s commandments. As a famous atheist wrote, “the New Testament says love or you will die. And if you love, they will kill you.” But it should not feed fear, hatred and persecution of those who are lost. Instead, it should bring them healing and forgiveness. Thank you Joseph, excellent points. It was the Holy Spirit that brought people to John, it was the Holy Spirit that made people seek out Jesus. It was the Holy Spirit that brought conviction to people for their need for Jesus. I am not the Holy Spirit. The more we know the depth of our sin, the more God’s grace is truly amazing. The average non-believer sees himself as basically good. He cannot truly know God’s grace and love until he knows how much he does not deserve it. I would not be so quick to say that non-believers do not know that they weaknesses and yes even sin. I also would not want to take the job of the Holy Spirit into my hands and seek to “enlighten” others to their sin. That conviction belongs to Him alone. My job, again, is to get to know non-believer and extend unconditional love to them, and then when they ask me about my faith or the reason I love or have hope for the future, I then can share. Placards, pickets, protests, angry, hateful, condemning words will hardly ever bring a person to repentence. Jesus’ words to the sinner were not that way, and if we follow Christ then ours should not be either. My job: Love God with all I am, love my neighbor—who could be my Samaritan (enemy)–as I love myself. And preach the Good News. The Holy Spirit’s job: Lead people into truth, convict, change lives. There is a difference between calling sin sin but showing the grace of God by treating people respectfully and extending the hospitality of the Kingdom of God; and calling sin sin and treating people like outcasts and less than human. sorry, I hit post on my question for @Philip up a little higher. If we are to be bringers of the Good news, loving neighbor as ourselves, the result in Scripture is not persecution of sinners but bringing them into the Kingdom. So if what we are doing and saying is feeding hatred and persecution, then there is something wrong with our tactics. And we need to rethink evangelism and the Gospel as we are experiencing it and communicating it. Mark, I didn’t say non-believers do not know they have weaknesses and sin; I said they see themselves as basically good. In other words, if you ask most anyone if they have weaknesses and sin, they will say yes without hesitating. But, ask them if they’re basically a good person and the vast majority will also say yes. They don’t believe their weaknesses and sin are a big enough deal to warrant God’s wrath and hell. Most will say they think their good outweighs their bad and God is “loving enough to look the other way”. There’s no recognition of the danger they’re in and therefore there’s no recognition of their desperate need of a Savior. Calling sin sin is not judging. If one freely admits to sinful behavior and we say that God’s Word says that behavior is sinful there’s absolutely no judging taking place; we’re just saying this is what the Bible says. The Spirit then either convicts that person that God’s Word is right on the matter or the person continues justifying their sinful behavior. Our speaking truth is neither judging or convicting. I couldn’t agree more that it is the Spirit that convicts and God who judges we just are called to speak the truth in love. We need to remember that scripture is very clear that the world will not like the message or those that preach it. It’s only those God is convicting and drawing to Himself that will welcome the message. The rest will think us narrow minded and judgmental for daring to agree with God’s Word on matters of what’s right and wrong. I don’t for one minute think it is appropriate to yell, scream and pridefully speak messages of hate to sinners. I know I am a big time sinner and I own a black belt in the ability to justify my sin. I am however, so thankful to God that the full message of the gospel which showed me the danger I was truly in wasn’t withheld from me until I asked a Christian why they we’re different. Knowing what God saved me from (i.e. His righteous judgement and condemnation which I richly deserve) gives me a better picture of His amazing grace and love. No one ever won someone to Christ with anger and hate!! !